How can I get review directly from Oberlo? Oberlo Integration function which allows you to import reviews at once and without a lot of actions and time consuming. From version 3.2, Ali Reviews is now integrated with Oberlo - most popular fulfillment app for dropshipper. 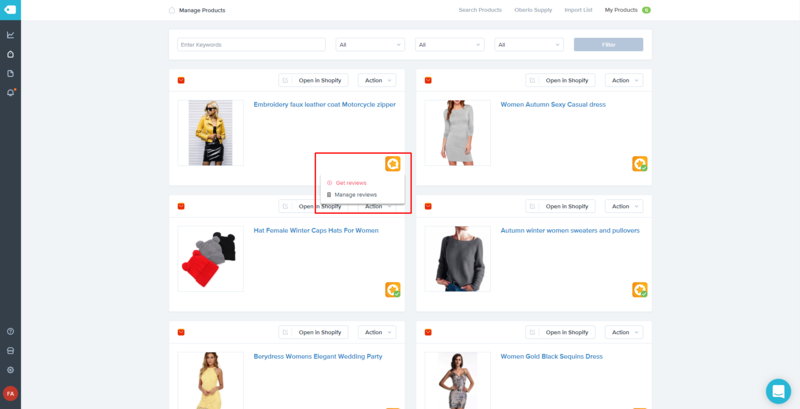 You now can click 1 button only from your Oberlo Product Page to get review directly from AliExpress without the need of filling product URL as usual. Sometimes due to connecting problem, the Ali Review icon may not show, just refresh your browser and try again. For more detail about how to use, please go to Ali Review Dashboard page - How to use. This feature is available in UNLIMITED package only.